There’s a amazing invention that not all of us know about. It’s an incredible concept: communicating with other people who are in different cars. Can you believe this? Even more amazing–this invention is in the palm of your hand. There’s a lever behind your steering wheel; if you push it down, it signals to the drivers around you that you are turning left. When pushed up, the signal indicates that you are turning right. This awesome form of communication helps navigate the flow of traffic and prevent accidents. This gift of communication was not always built into our vehicles. In the early 1900s, turning signals were done by putting your arm out your car window. To indicate a left turn, you’d put your arm straight out the window. To indicate a right turn, your arm is turned up at a right angle. To indicate that you are stopping, you would put your arm down at a right-hand angle. Bicyclists use these signals to this day. Luckily, there’s no more putting your arm out of the window of your car in the rain/snow to communicate with other drivers. Now, we can use the built-in turning signal. Numerous people had the idea of providing an easier way to signal your next move. According to secondchancegarage.com, in 1907, a man named Percy Douglas-Hamilton got a patent for a device that simplified the communication of turning in vehicles. The original lights were shaped like hands. The hand signals were similar to the ones already being used, making it easy for other drivers to read. Nearly a decade later, a successful, silent-film actress named Florence Lawrence had a similar idea. Due to her success in acting, she was able to buy a car which she adored. In 1914, she designed a mechanical arm that moved a flag on the car’s rear bumper by the press of a button. The flag was either raised or lowered depending on the direction the car was going. Though she designed this invention, she did not patent it. Another patented invention came in 1925 by a man named Edgar A. Walz Jr., which is known as the first modern-style turn signal. After trying and failing to sell the invention to car manufacturers, the patent expired after fourteen years. As a matter of fact, Buick was the first car manufacturer in the United States to offer flashing turn signals installed in the vehicle. Buick put these vehicles on the market in 1939. These original turn signals only flashed on the rear lights. It wasn’t until 1940 that Buick began to manufacture vehicles with the signals extending to the front lights as well. The article on secondchancegarage.com informs us that the turning signal was advertised as a “Flash-Way Directional Signal.” Interestingly, in the beginning, these lights were optional on cars–for an additional cost. 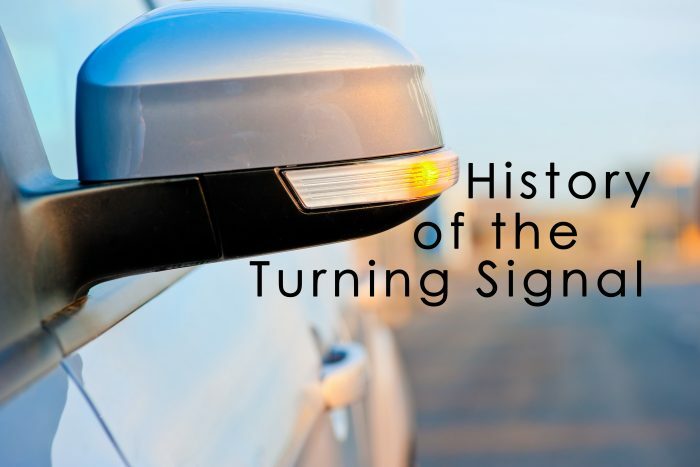 Turning signals on vehicles continued to evolve throughout the years. However, the modern technology of turning signals has remained the same since around the 1980s.